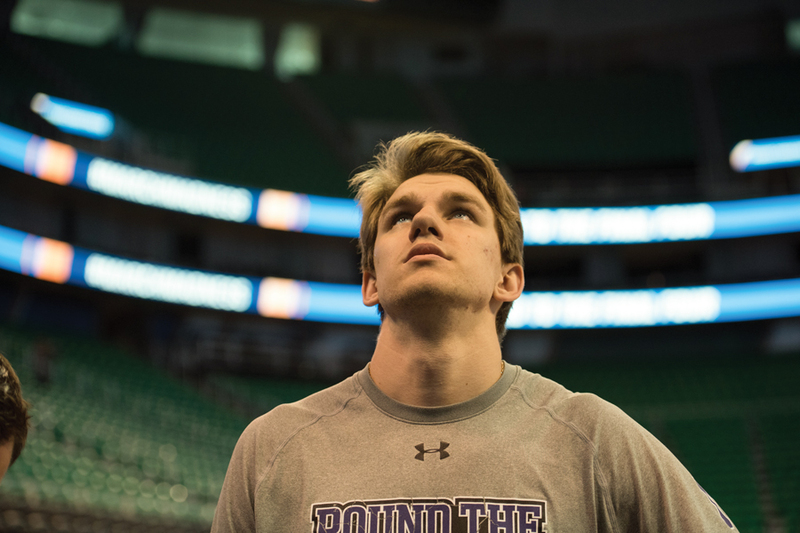 Rapolas Ivanauskas looks on prior to a 2017 NCAA Tournament game. The forward announced Tuesday his intent to transfer from Northwestern. Redshirt freshman forward Rapolas Ivanauskas will transfer from Northwestern to another school for the 2018-19 basketball season, according to a Tuesday news release. Ivanauskas joins sophomore guard Isiah Brown as the second player in as many months to announce their intent to leave the Wildcats’ program. In Brown’s case, the shoot-first guard showed flashes of top-level talent but never seemed to fit well in coach Chris Collins’ system and struggled with efficiency. In Ivanauskas’ case, however, the lanky forward just never managed to stay healthy enough to see the court. The 6-foot-9 Illinois native played in only three games in his Evanston career, recording three rebounds and 0 points in just 11 total minutes of action. He missed the entire 2016-17 season with a shoulder injury, technically redshirting to maintain his four years of eligibility, and then re-injured the same shoulder early in the 2017-18 season, causing him to miss the remainder of the year. Ivanauskas had initially arrived at NU as a highly touted, four-star recruit, rated the 89th-best in the country in Rivals.com’s 2016 rankings. His departure means the Cats will return just seven total scholarship players from this past season’s roster next year, putting pressure on a much-hyped incoming freshman class to contribute immediately.